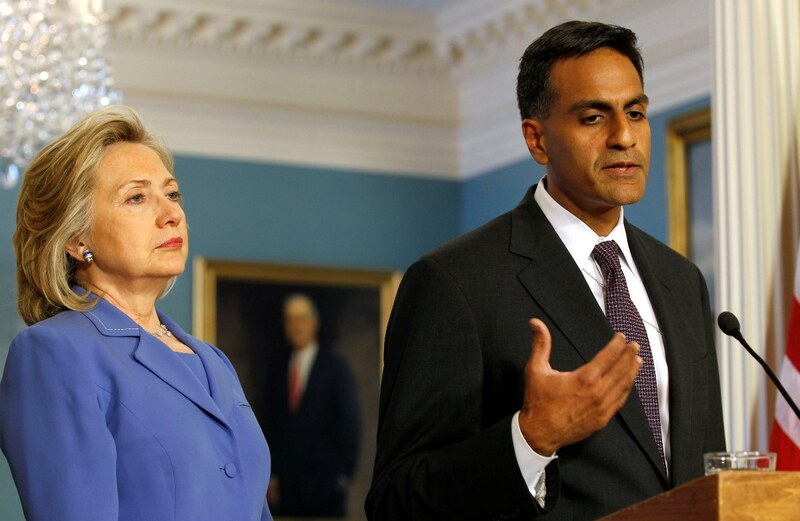 Richard Verma '90, a national security expert who has served in the U.S. State Department and the U.S. military and as an adviser to members of Congress, has been nominated by President Obama to be the next U.S. ambassador to India. The nomination of Verma, who served as assistant secretary of state for legislative affairs under Hillary Clinton from 2009-11, comes as Indian Prime Minister Narendra Modi is making his first state visit to the United States. The nomination also comes at a "moment of transition" in the relations between the world's two largest democracies, said Nandini Deo, assistant professor of political science, an expert in comparative politics and coauthor of the 2011 book The Politics of Collective Advocacy in India: Tools and Traps. "Richard Verma will have to convince the Indian public that President Obama's administration is not a lame duck one," said Deo, "and that the President can actually push through important initiatives in technology cooperation, while ending disagreements about approaches to climate change mitigation and deepening economic ties." During his service in the State Department, Verma led the Obama administration's negotiations with Congress for new sanctions on Iran while working for passage of the New START nuclear arms treaty with Russia. He received the Distinguished Service Medal, the State Department's highest civilian honor. When Verma left the department in 2011, Obama thanked him for his "valuable service, skilled judgment and leadership. "You played a key role in our efforts to ratify the New START treaty, to manage the response to the tragedy of the Haiti earthquake and to negotiate a powerful Iran sanctions bill. You worked in a demanding environment and always responded with able advice and good humor. I appreciate your dedication and professionalism." Verma attended Lehigh on an Air Force ROTC scholarship and earned a B.S. in industrial engineering, while minoring in international relations. He was commissioned a second lieutenant in 1990 and went on to attend law school at American University in Washington, D.C., where he graduated with honors in 1993. From 1994 to 1998, Verma was on active duty with the Air Force as a judge advocate, advising military commanders, trying criminal cases and providing pro bono legal service to members of the military services and their families. He was awarded the Meritorious Service Medal, the Air Force Commendation Medal, and the National Defense Service Medal. During this time, he earned an international law degree from Georgetown Law Center. From 2002-07, Verma served as senior national security adviser to current U.S. Senate Majority Leader Harry Reid, D-Nevada. Earlier in his career, Verma worked in the office of the late Jack Murtha, D-Pennsylvania, chairman of the Defense Appropriations Subcommittee in the U.S. House of Representatives. In 2008, Verma helped then-Sen. Barack Obama prepare for his presidential debates. That same year, he was appointed by Congress to the Commission on the Prevention of Weapons of Mass Destruction Proliferation and Terrorism, where he helped write the report "World at Risk." Verma is now a senior counselor in the Washington, D.C., office of Steptoe and Johnson LLC, an international law firm. He specializes in national security law, international regulatory compliance and public policy. At Lehigh, Verma was a member of Lambda Chi fraternity and senior class president. Since graduating, he has served on the university's board of trustees and on the board of directors of the Lehigh University Alumni Association. Verma's parents emigrated from India's Punjab state to the United States in the early 1960s. In 2007, he was named by the organization India Abroad as one of the 50 most influential Indian-Americans. A paper he wrote warning that environmental changes and resource scarcity could cause unrest in South Asia has been published in a book by the World Wildlife Fund. If Verma's nomination is approved by the U.S. Senate, he will become the first Indian-American to serve as ambassador to India and the first assigned to a major country.